Wonder Wafers are the air freshener that is even scented, not overpowering but long lasting. They work better than liquid air fresheners simply because they release the perfume oils evenly and perfectly over a period of time instead of being overwhelming in the beginning and weakening too rapidly. Each Wonder Wafer is individually wrapped to maintain it's freshness and can be used in cars, closets, bathrooms, drawers, in the garage and more! Wonder Wafers Clean Car provides a clean and fresh smell for your automobile's interior. whether your car interior is new or used, capturing the leather smell is easy with Wonder Wafers. 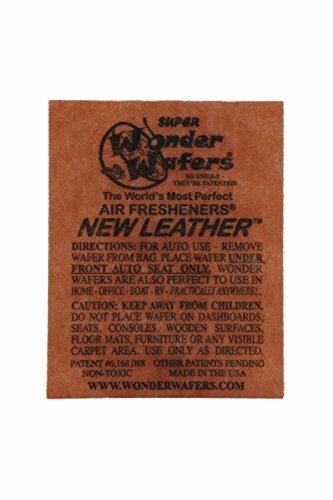 Wonder Wafers New Leather is the best air freshener to restore the leather smell in your auto. Achieving the leather smell has never been easier, in fact, you will have that leather odor instantly upon application. Car fanatics nationwide seek out and use Wonder Wafers New Leather for that craving new car leather smell. If you crave the unique leather smell for your auto, than Wonder Wafers New Leather scent is the best air freshener for you (Do not place wafer on dashboards, seats, consoles, wooden surfaces, floor mats, furniture or any visible carpet area). WARNING: This product can expose you to chemicals which is [are] known to the State of California to cause cancer and birth defects or other reproductive harm. For more information go to www.P65Warnings.ca.gov. Remove the wafer from plastic seal, and place one wafer under the car seat. If you have any questions about this product by Wonder Wafers, contact us by completing and submitting the form below. If you are looking for a specif part number, please include it with your message.